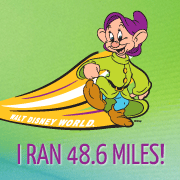 While I know many of you probably follow this blog because you’re runners (I promise my Walt Disney World Marathon Weekend recaps will be up soon! ), and I’ve primarily used this little piece of the internet for my training accountability, race recaps and running thoughts, I’ve also occasionally posted about my decision to go back to school and my 5 (turned 6) year plan to become a physical therapist. Three years ago I left my career working in event planning in professional sports. I spent the first few months doing yoga teacher training and then for the past two and a half years I’ve been working through the MANY pre-requisite classes I needed to have to apply to physical therapy doctorate programs. I did over 100 observation hours in different PT settings, worked as a physical therapy aide, studied for and took the GRE’s and in October I finally submitted applications to 5 schools. It’s felt like a long road. I hit some bumps along the way. I got distracted. I got frustrated. I (often) questioned if I had made a huge mistake. Just submitting those applications was unbelievable. After working towards this goal for so long I was finally at the point of applying to doctorate programs! My biggest fear all along has been doing all this work, spending all this time and money and NOT getting into a program. Yesterday, I got my first acceptance letter. I wasn’t expecting to hear from schools until February, so when I saw the e-mail I literally had to read it several times to make sure I really was reading it right. I honestly can’t believe that after almost 3 years of working towards this goal I now know that I actually AM going to go to PT school. I have been fortunate to have an amazing support system (including all of you! ), so THANK YOU! I can’t tell you how much it means to me and while getting into a doctorate program feels like the end of a long journey, it’s really just the beginning – physical therapy school is another 3 years, but I can’t wait! Congratulatons Danielle, that is such wonderful news!!! CONGRATULATIONS!!!!! That’s so incredibly exciting. You must be on cloud nine. You’ve certainly earned it. Enjoy basking in the moment!! Congratulations Danielle!! I’m extremely happy for you!!! Your posts are motivating and inspiring whether about running, yoga, school, etc! Thanks for including us. You’ll be great!! Congrats! That’s awesome! Your dedication has been recognized and will result in a well-earned doctorate, I’m sure! CONGRATS!!!!! I can honestly say that if it wasn’t for my amazing PT Pam, I don’t think running would have ever been in my future again. Trust me, you will make more of an impact on someone’s life than you will ever know. Awww, that means so much to me, thank you!! « Goofy Challenge -2 Races, 2 Finish Lines!